This is a short, sharp Possums post. And please- share it with as many colleagues and teams as you can, and with anyone you care about. Because this is a powerful message which- if you screw it up- will have huge ramifications. Here it is. Help Me Save A Life Next Week- And No Money Asked For- Promise! I wrote a post once about knowing when to ‘turn up.’ Read it again or read it for the first time. Please. And then join me please in turning up next week, on Thursday 12 September. Together we can save a life, or several. No joke. Here’s how. I want to spread the word about an incredibly important day, Thursday 12 September. If you get any value out of Possums, then the one thing I ask of you in return is this: retweet this post NOW, ‘Like’ it, pass it on in LinkedIn, do whatever you can to spread the word. It’s a day that was inspired by a colleague, Gavin Larkin, who sadly passed away about two years ago after a long illness. This day is one of his many legacies of an action packed life well led. Gavin made a massive contribution, and we miss him. I wrote a post once about knowing when to ‘turn up.’ Read it again or read it for the first time. Please. And then join me please in turning up next week, on Thursday 13 September. Together we can save a life, or several. No joke. Here’s how. 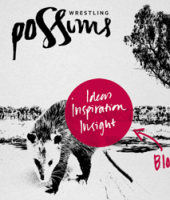 CEO Mike suggested I use Possums this week to spread the word about an incredibly important day, Thursday 13 September. It’s a day that was inspired by a colleague, Gavin Larkin, who sadly passed away late last year after a long illness. This day is one of his many legacies of an action packed life well led. Gavin made a massive contribution, and we miss him. It’s a day he designed, with others, and is built around saving lives by asking one very simple question. Here it is. My mind kept wandering while watching the London Olympics to the greatest Olympic moment ever- in my view: a moment of disaster and of triumph- a moment I share regularly with anyone who will listen. It’s a moment with an incredibly powerful message for life, and for success. Here it is. I got so motivated by the Olympics that I put down the chocolate bar, bought a stop watch and went up to the local oval to time my 400 meter ‘sprint’. Nearly killed me. First go- 2 minutes 12 seconds. Second go- 2 minutes 2 seconds. Third go- there was no third go. To grow successful careers in services firms or deliver to your internal ‘clients’ in a world class fashion, we have to recapture and relentlessly implement an attitude sadly missing from many in business today. Without it, we will fail. Here it is, and the 10 Vital Habits of the very best professionals I know. Winning clients is far easier than keeping them. Chuck Porter, the founder of iconic agency Crispin Porter Bogusky, told the 2010 Cannes Creativity Festival his secrets to building a great agency. “Hire Client Ninjas” was a key point: talented executives who live and breathe delivering outstanding service and value to the client. Keeping clients is the key to building a big business.